had once been joined to form a single supercontinent. • He called this supercontinent Pangaea, meaning all land. South America and Africa had once been joined. separated by oceans provide evidence for continental drift. describe a mechanism capable of moving the continents. • The theory of plate tectonics proved that Wegener was correct. major ocean basins like the seam on a baseball. that uses sound waves to calculate the distance to an object. curved valleys along the edges of some ocean basins called deepocean trenches. • A rift valley is a deep, central valley that runs down the center of a ridge. finally sinks back into the mantle beneath deep-ocean trenches. sinks beneath a deep-ocean trench. shown by patterns of magnetism in rocks that have formed over time. relative to each other, driven by convection currents in the mantle. • The lithosphere is broken into several huge pieces, called plates. 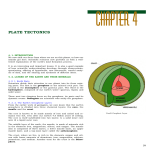 • Deep faults separate the different plates. combination of each of the three types. • Convergent boundaries form where two plates move together. features including trenches, volcanoes, and mountain ranges. in part by the subduction of oceanic lithosphere. build a chain of islands called a volcanic island arc. eventually merge, creating complex mountains. because of differences in density. it can flow slowly over geologic times. radioactive isotopes in the mantle and heat from the core itself. process takes millions of years. mantle plumes are involved in the upward flow of rock in the mantle. relatively cold and dense, down into the deep mantle. asthenosphere that is elevated near mid-ocean ridges.